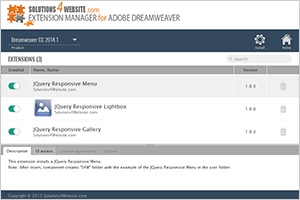 JQuery Responsive Menu is distributed as an Adobe Dreamweaver extension, packed as a file, named JQResponsiveMenu.mxp. Read more in the online help. Intuitive and eye-catching site navigation is very important part of any website design. We consider this professionally made mega menu to be really great, powerful and exactly what you need as it has lots of features and options. First of all it has responsive design which makes sure that both desktop and mobile site visitors will get accessible and convenient navigation. It will allow you to create both vertical and horizontal responsive menus. You can create horizontal drop down menu with two different sub-menus layouts, vertical menu with a side drop and vertical accordion slider menu. Additionally to enrich visual menu appearance menu items can have icons and sub titles. Mega menu is based on HTML list of links and actively using latest CSS3 features and transitions. 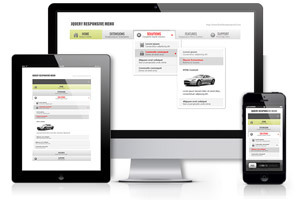 Component is fully browser compatible, and will work on mobile devices. Menu is search engine friendly, as all the menu titles, subtitles and links are placed directly in page code, absolutely accessible to search engines. You don't need to be an expert in web design and to know programming languages to add navigation for your site. User interface allows you to create your menus, change their appearance without the need for complex hand coding and manual css editing. The installation package contains Dreamweaver extension, providing you the ability to easily create unique and beautiful HTML5-powered mega menus. There is no need to dig into CSS files to make some changes in menu style. Visual design user interface allows you to change almost everything to fit the look and feel you want without the need for complex hand coding. 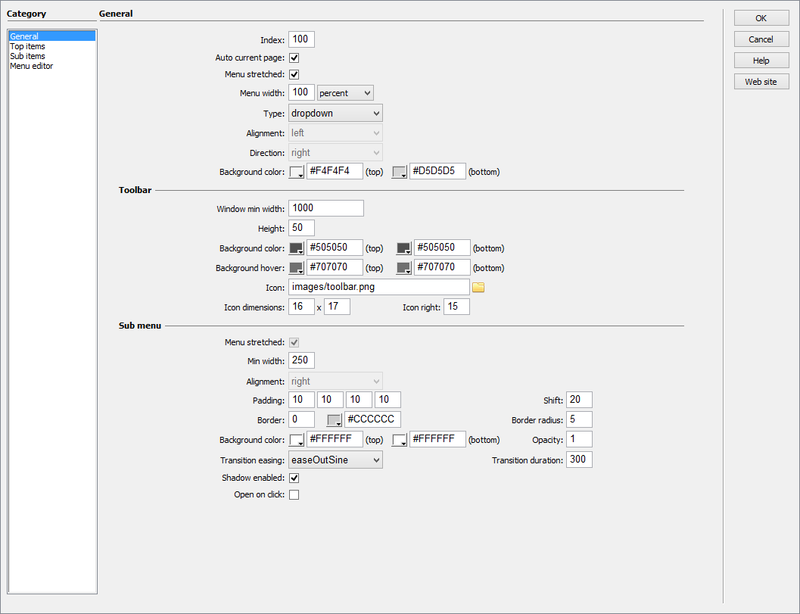 Component includes several menu layouts: horizontal with horizontal drop down sub-menus, horizontal with vertical drop down sub-menus, vertical menu with both sides drop down and vertical accordion slider menu. The installation package contains Dreamweaver extension, providing you the ability to easily create unique and beautiful HTML5-powered mega menus. Extension has user friendly interface.